Suppose we start with an acute angled triangle where the sides are of length x, y, and z, where 0<x≤y≤z. Let the corresponding angle sizes be denoted by X, Y, and Z (assume radians). Then X < π/2, since the triangle is acute-angled and so 2X < π = X+Y+Z. It follows then that X<Y+Z. Similarly it is easy to show that, Y<X+Z and Z<X+Y. 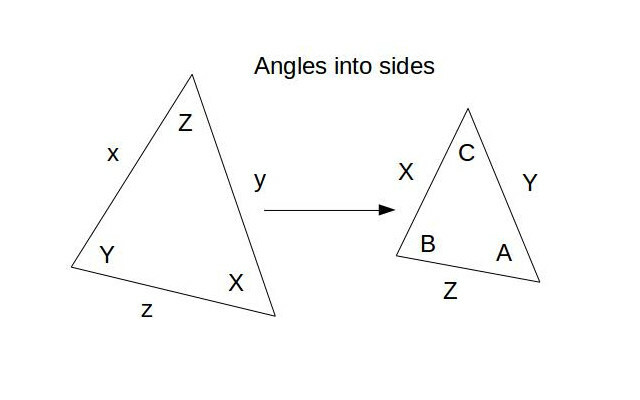 So, X, Y and Z (the angle sizes of the acute-angled triangle) can also be the lengths of the sides of another triangle. It should be fairly obvious that this only works if the original triangle is acute-angled, i.e. it does not work if the original triangle is right or obtuse. By chance I happened to notice that for an acute triangle with angle sizes 45o , 60o and 75o , the angle sizes also form a Pythagorean triple. Basically, these numbers are a multiple of (3, 4, 5). Any others? The only other acute-angled triangles where this property holds are those where the angles are 30o , 72o and 78o (5, 12, 13) and 18o , 80o and 82o (9, 40,41). Proof that 3YZ/2π ≤ π/2 –X< 2YZ/π. Assume that (x,y,z) is acute-angled and that its corresponding angles are X,Y, and Z. Let the triangle (X,Y,Z) formed by (side lengths) X, Y and Z have corresponding angle sizes A, B and C as above. Since we have assumed that 0<x≤y≤z, it follows that 0<X≤Y≤Z and so, since Z<π/2, A, B and C exist and 0<A≤B≤C. We also have, π = X+Y+Z and π = A+B+C. Since (x,y,z) is acute angled, X≤π/3 and π/3≤Z<π/2. It must also be true that A≤π/3, and π/3≤C. From 0<A≤π/3 we must have that 1/2≤cos(A)<1. Now π = X+Y+Z and so π –X=Y+Z. YZ ≤π2– 2πX – 2YZ < 2YZ or 3YZ ≤π2– 2πX < 4YZ. i.e. 0 < π/2 –Z ≤3XY/2π becomes XY/π < π/2 –Z ≤3XY/2π. From Y = (π/2-X)/(1-X/π) and π =X+Y+Z we get Z= (π2/2-πX+X2)/(π-X). Hence if (X,Y,Z) is right angled, then Y and Z are effectively determined/parametrised by X. (13π/30)2 = (π/6)2 + (2π/5)2. (Note: (X, Y, Z) is just a (5,12,13) triangle). If (X,Y,Z) is right angled and isosceles then X = π/(2+√2), Y= π/(2+√2), and Z= π/(1+√2). Now X lies in the range 0<X≤π/3 and as X-> 0, Y and Z-> π/2. However, as X->π/3, Y-> π/4 and Z->5π/12, which is just a (3,4,5) triangle scaled by π/12. This can’t be the case though because we have assumed that x≤y≤z and so X≤Y≤Z. Y>X while X is near 0 but Y decreases as X increases towards π/3 until Y=X= π(2-√2)/2. At that point (X,Y,Z) is right angled at Z, and Z= π(√2-1). If (X,Y,Z) is right-angled, and π(2-√2)/2<X≤π/3, it follows that Y<X, but this is not possible since we have assumed that X≤Y. If π(2-√2)/2<X≤π/3 it is straightforward to show that (X,Y,Z) is also acute angled. First π = X + Y +Z and X≤Y mean that Z ≤π– 2X and since π(2-√2)/2<X it follows that Z<π(√2-1)<π/2. Hence the result. Put another way, if you start with an acute-angled triangle where the smallest angle lies roughly from 52.7 degrees to 60 degrees and you generate another triangle using these angle sizes as the lengths of the sides, the generated triangle must also be acute-angled. If however, 0<X≤π(2-√2)/2 then it is easy to show that the generated triangle can be acute, right or obtuse. Note: (2-√2)/2 ≈ 0.292893219. ((5/12)π)² = ((1/4)π)² + ((1/3)π)². (Note: (X, Y, Z) is just a (3,4,5) triangle). ((q-p)² + p²)² = ((q-p)² – p²)² + (2p(q-p))² but having used little discernible number theory along the way. Obviously an equilateral triangle is similar to its ‘inside-out’. I strongly suspect that this is the only acute angled triangle with this property. Suppose we start with an acute-angled triangle where the sides are of length x, y, and z. Assume without loss of generality that 0 <x≤y≤z. Let the corresponding angle sizes be denoted by X,Y, and Z (assume radians). x/X = y/Y = z/Z. Applying the sine rule to(X,Y,Z) it follows that X/sin(X) = Y/sin(Y) = Z/sin(Z). and so if f(a) = f(b), a, b ∈ (0,π/2), then a = b. It follows then that X/sin(X) = Y/sin(Y) = Z/sin(Z) implies that X = Y = Z, since X, Y and Z∈ (0,π/2), and so naturally x = y = z, i.e. (x, y, z) is equilateral. So if an acute angled triangle is similar to its ‘inside-out’ it can only be equilateral. Note: If (x,y,z) is an acute-angled triangle as above, with corresponding angles X, Y and Z, then (X,Y,Z) forms a triangle where X + Y + Z = π, or what might be called a π-triangle. If (a,b,c) represents any triangle, then πa/(a+b+c), πb/(a+b+c), and πc/(a+b+c) represent the angles of an acute angled triangle. Clearly πa/(a+b+c) + πb/(a+b+c) + πc/(a+b+c) = π and if (say) πa/(a+b+c)≥π/2 then a≥ b + c which contradicts the assumption that (a,b,c) forms a triangle. Finally, a connection with Fermat’s Last Theorem. z n = x n + y n , has a non-trivial solution in positive whole numbers x, y and z, then we can also assume without loss of generality that 0 < x < y < z. It is easy to show that, for such a non trivial solution, z < x + y, and so it follows that x, y, and z can form the sides of a triangle. In the case n=2, that triangle is right-angled, but in every other case, i.e. n>=3, it is straightforward to show that the triangle (x, y, z) is acute-angled. Proof – that (x, y, z) is acute-angled if n>=3. If n>=3, it is straightforward to show that z 2 < x 2 + y 2 if a non-trivial solution x, y, z to Fermat’s equation exists. Let the corresponding angle sizes in triangle (x, y, z) be denoted by X,Y, and Z. Then cos(Z) = (x2+ y2– z2)/(2xy), and so cos(Z)>0, i.e. Z(largest angle) is acute, so the triangle is acute angled. where 0<cos(Y)<1 and 0<(x/z)n-1<1 etc. Is it true then that cos(Y)= (x/z)n-1and cos(X)=(y/z)n-1?? In the case n=2 this is certainly true. z n-2 = (y n – x n )/(y 2 – x 2 ). If we assume that z n-2 >= (y n – x n )/(y 2 – x 2 ) it is easy to show that a contradiction arises. Hence it is certainly true that z n-2 < (y n – x n )/(y 2 – x 2 ). If z n = x n + y n then z i < x i + y i is easily established for all i in the range 1, 2, … n-1. Hence, z n-2 < x n-2 +y n-2 . So, z n-2 >= (y n – x n )/(y 2 – x 2 ) implies that (x n-2 + y n-2 )(y 2 – x 2 ) > y n – x n .
Multiplying out this last inequality and simplifying gives x n-4 >y n-4 which is not possible if n>=4. 0 > x 2 – 2xy + y 2 or 0 > (x – y) 2 which again is not possible. Hence the result is proved. If n=3 this inequality becomes z<(y3-x3)/(y2-x2) or z<(y2+xy+x2)/(x+y). This last inequality leads to z-y<x2/(x+y) and z-x<y2/(x+y). It is straightforward to show that these inequalities are also true for all n>3. If a non-trivial solution, (x,y,z), n>2, to the Fermat equation exists, then, as has been shown above, (x,y,z) is an acute angled triangle. An interesting construction can be drawn inside this triangle, which I would show here, if this system would only allow me to display it. Basically, a smaller (and similar) triangle (x(x+y-z)/z, y(x+y-z)/z,(x+y-z)) can be drawn inside (x,y,z). Clearly since zn = xn + yn then (x+y-z)n = (x(x+y-z)/z)n + (y(x+y-z)/z)n. x+y-z is obviously an integer and it is easily shown that 0<x+y-z<z, 0<x(x+y-z)/z<x and 0<y(x+y-z)/z<y. If it can be shown that x(x+y)/z and y(x+y)/z are also integer then the method of Infinite Descent could be invoked. In the paragraphs immediately above, the terms x+y-z and xy/z appear. I wondered if there was some connection between these terms independent of Fermat’s equation. It turns out that there is, i.e. x+y-z<xy/z if z≠0 and (z-x)(z-y)>0. Assume that z≠0 and (z-x)(z-y)>0. Consider xy/z-(x+y-z). xy/z-(x+y-z) = (xy-z(x+y)+z2)/z = (x-z)(y-z)/z = (z-x)(z-y)/z>0. Hence the result is true. So if we had (say) 0<x<y<z then (using explicit * for multiplication and / for division) we have x+y-z<x*y/z. Clearly the LHS and RHS of < have the same structure but just different operators inserted. -(1/y)(y2 – y(x+z) + xz) = -(1/y)(y-x)(y-z) = (1/y)(y-x)(z-y)>0. Hence this result is also true. Again if 0<x<y<z, then -x+y+z<yz/x. Consider -x+y+z-yz/x = (-1/x)(x2 -x(y+z) +yz). Then,-x+y+z-yz/x = (-1/x)(x-y)(x-z) =(-1/x)(y-x)(z-x)<0. Hence the result.